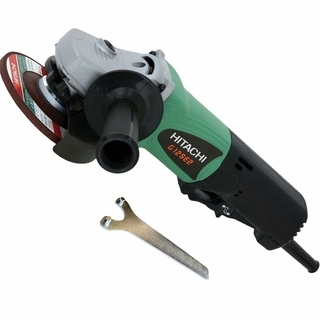 The Hitachi Disk Grinder uses a heavy-duty 9.5 Amp motor to provide you with 1,900 watts of forcible output power for the toughest grinding jobs, it offers a no-load speed of 10,000 RPM. The commercial-grade helical cut gears increase durability and the specially sealed armature coil reduces wear caused by ingested debris. Weighing only 4-1/5 pounds, this tool's lightweight, ergonomic design makes it easy to use, the paddle switch with lock-on feature and 2-position removable side handle also increase comfort and control. This tool comes with a spanner wrench and a 4-1/2-inch diameter, depressed center grinding wheel with standard 5/8-inch arbor, the tool-less wheel guard can be adjusted to any angle for added versatility. The convenient carbon brush access allows you to replace the brush as needed to greatly prolong the life of the tool. This product is backed by a 1-year limited warranty.